Well, it's short, less than a minute, but I find it inspiring. Iggy is in fine voice, strong and passionate with his delivery. Because YOU are a DIFFERENT dog. Iggy then barks and howls as the prepared piano crescendos the "I Wanna Be Your Dog" chord progression. It's brevity has me considering it a fossil poem. It certainly says a lot with few words and barks. Earlier I brought up the Tales of the Tribe online course by Robert Anton Wilson that had such a strong effect on me. One of the things Wilson introduced was the idea of "fossil poems." As I understood it at the time, "fossil poems" meant viewing short phrases with a poetic eye, sometimes common phrases you wouldn't think twice about. For instance, you might be watching CNN and hear the anchor say something in the course of reporting that rings a poetic nerve. By virtue of this science the poet is the Namer, or Language-maker, naming things sometimes after their appearance, sometimes after their essence, and giving to every one its own name and not another's, thereby rejoicing the intellect, which delights in detachment or boundary. The poets made all the words, and therefore language is the archives of history, and, if we must say it, a sort of tomb of the muses for, though the origin of most of our words is forgotten, each word was at a stroke of genius, and obtained currency, because for the moment it symbolizes the world to the first speaker and to the hearer. The etymologist finds the deadest word to have been once a brilliant picture. Language is fossil poetry. As the limestone of the continent consists of infinite masses of the shells of animalcules, so language is made up of images, or tropes, which now, in their secondary use, have long ceased to remind us of their poetic origin. But the poet names the thing because he sees it, or comes one step nearer to it than any other. This expression, or naming, is not art, but a second nature, grown out of the first, as a leaf out of a tree. This Emerson quote which I just found comes courtesy of an old friend, Toby, who often goes by the name Bogus Magus on the Maybe Logic Academy boards. Bogus was one of the dozen or so people who made it all the way through of the Tales of the Tribe course. All this preamble about fossil poems sets up a fossil poem I noticed that abstractly fits with Iggy Pop's Squarehead lyrics. Squarehead is the 10th and final song on Instinct. You can say, "Just do it, everyone is"
But I ain't gonna be no squarehead Let's go! The fossil poem comes from a book of potent poetry called The Path Workings of Aleister Crowley: The Treasure House of Images. The author is not Crowley but one of his students, J.F.C. Fuller. O Thou four-square Crown of Nothing, that circlest the destruction of worlds! I adore Thee, Evoe! I adore Thee, IAO! IAO is a gnostic name for God. Ok, so it seems a bit of a stretch, I'm just in one of those moods ... it helps to listen to Squarehead with this fossil poem close by. PS The Treasure House of Images has been known to work as a sort of bhakti grapple hook for jumping brain circuits, or accessing parallel worlds etc. The book was published by Christopher Hyatt's press, New Falcon in the 1990's. LJ said..." I love "Instinct". Its always been my favorite Iggy solo album, I think was the first album I bought with Bill Laswell's name on it. It has lot of power and understatement. Steve Jones' guitar fits beautifully. The sound is crystal clear and haunting. The lyrics are deep in places, or just funny as "Squarehead"." This comment recalls another story from the Instinct mixing sessions. Iggy arrived at the beginning of one session to recut a vocal. My understanding is that he had written completely new lyrics to one song, the song that became Squarehead. I didn't ever hear the song before it became Squarehead. We set up a Neumann U47 Tube 47 and gave it some mild compression with a Summit TLA across the insert. Iggy knocked out the lead vocal in one take. There might have been a punch-in or two along the way, I don't remember, but I do remember it going very quickly. After he got the lead vocal, Iggy went in and did a 3 part doo wop style background vocal part for the bridge. Each of these vocals were also done in one take. They were not perfectly in tune but the dissonance and rawness of the part perfectly fit the mood of the lyrics. It took less than an hour to do all the vocals for Squarehead. We were tracking overdubs for The Swans album that eventually became The Burning World at Platinum Island's Studio East. I was assisting Bob Musso, Bill Laswell was producing, when Iggy Pop walked in to check out the music. After listening to a track, Iggy asked Bill for some help with a performance piece he was making for a festival honoring genius and pioneering avant garde music composer, John Cage. Iggy had written a poem for the occasion and wanted a backing track of some kind to go with it. Bill had the idea to make a "prepared piano" and play the melody to I Wanna Be Your Dog which I think could safely be called Pop's theme song. A prepared piano is a technique of altering the timbre of a piano by putting objects on, and in-between the strings. John Cage was known for these experiments and composed pieces for the prepared piano. So we "prepared" the grand piano with paper clips, rubber bands, nails and other things that rattle in the night. I don't remember exactly how we miced it, maybe with a couple of U87's one closer to the hammers aimed toward the high strings, and the other at the back capturing the low strings. Bob quickly got a blend between Iggy's voice and Bill on the piano and recorded the piece live to a Studer A80 1/2" tape machine. They only did it once, one take, and that was that. I only vaguely remember the poem but recall as it feeling both "beat" ( as in Kerouac and Ginsberg etc.) and punk with a strong emphasis on the right of the individual to be who they are. I should have a copy of it somewhere which I'll have to dig up. At the time it sounded incredibly right on, hitting the nail squarely on the head in terms of where I was coming from. We dubbed a 1/4" copy for Iggy, the format for submission to the Cage Festival, and Iggy went on his way, mission accomplished. In the latest Rolling Stone magazine Paul Simon raises the question of whether song lyrics can be considered poetry or not? I think they can. If the words move you just as strongly what difference does it make what you call them. Both poetry and song lyrics effectively use words to conjure images, feelings and moods that can alter consciousness to greater or lesser degrees. Ritual magick is often not much more than the imaginitive reading of inspired poetry. Poetry that exalts the consciousness outside of the mundane. Great songs do the same for me. After we finished mixing Instinct, the album Laswell produced for Iggy Pop not too long before the Cage project, we had a playback of all the mixes in sequence for Iggy. The album sounded great! The production was as raw and noncommercial as the old days with the Stooges but pushing the envelope with modern technology and know how. Iggy's lyrics and delivery were brilliant and passionate, classic rock-n-roll. Maybe it's because I heard them a lot in the mixing sessions - and at home to check the mixes out, and just to enjoy listening to the latest offering from a genius songwriter, but the lyrics seemed to reach to the core of my being and back out again to some of the further regions. I heard Jungian style archetypes in them that had immediate and practical applications for my life's journey as it then unfolded. I thought the name Instinct was perfect for it. Iggy didn't react much and gave little expression during the playback except for rocking a bit in his chair. At the end, he said everything was good except for one thing. He was concerned that his singing on Cold Metal, the opening track, got boring as it went along. Bill Laswell and Bob Musso both told him it was great. Iggy responded, shaking his head, "I don't know..."
Bob mentioned a teenager who had heard and really liked it. Iggy wasn't convinced and stood there struggling with the decision. Bill said, "We're scheduled to master tomorrow, but it's your call, we can cancel, whatever you want to do..."
Finally, I couldn't help myself ( I was the assistant engineer and wasn't supposed to offer an opinion unless asked) and blurted out, " Those lyrics are so intense it doesn't matter how you sang them!" Iggy immediately lit up and said, "Ok! Let's go with it. I believe he was reacting more to my enthusiasm rather than to what I actually said. To start with, Cold Metal seemed to describe my living situation with pinpoint accuracy. At the time I was residing on South Street in Manhatten's Lower East Side. It was a 26th floor apartment with a balcony overlooking the East River, Brooklyn, and you could easily see both the Brooklyn and Williamsberg bridges. FDR Drive was directly below. Also right below, and a little to the North was a floating prison barge docked on the river. 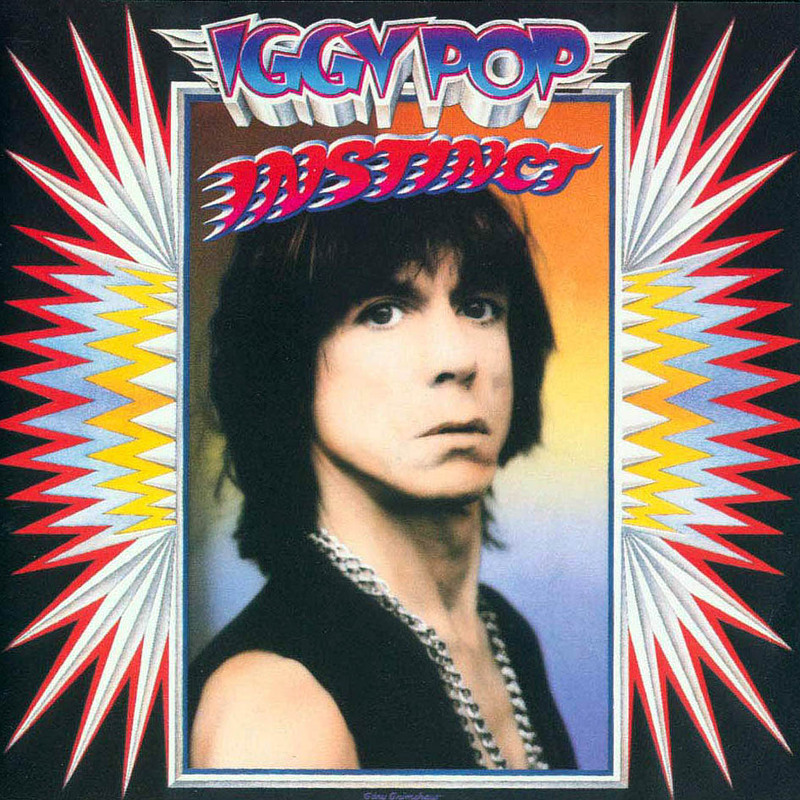 Cold metal was the song from Instinct that made it onto Iggy Pop's Greatest Hits cd. It was also featured in an episode of Miami Vice. There is none other God is. can have a much more expansive meaning especially when interpreting "auto" as something other than a car.